Yes you read right, this article will be very educational. You can learn how to funk up the ethnic and traditional clothes and wear it to college. Girls are wearing plazos, long skirts, kurta’s in their way. Younger generations basically embracing the tradition in their way, and what’s wrong with it? NOTHING! The clothes look amazing, the girls look decent and beautiful and that’s what all guys want too. This style became popular after the movie 2 states, in which Alia Bhatt looked breathtakingly beautiful wearing such outfits. She wore long skirts with tops, slips, etc. she wore kurtas in a beautiful way. Not to forget her hair and makeup also complimented her look. Her simple everyday makeup and braided hair was everything a person can wish for, so she will be my inspiration today. This was one of the most popular styles. You don’t need to wear western everyday to be stylish. Embrace the traditional wear, it is the most comfortable style and looks amazing. A long skirt with a sleeveless top, belt, bangles, earrings, flat sandals go a long way and to compliment this look you can do braids and fresh everyday makeup. 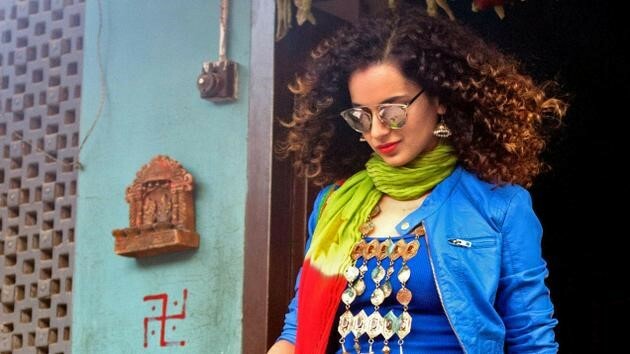 We have all seen Tanu aka Kangana Ranaut rock dhoti pants in Tanu weds Manu returns. That look still blows my mind. Dhoti pants along with, a slip, leather jacket, long funky necklace, jhumkas, scarf, jutti’s, bracelet/bangles and to top it off mind blowing sunglasses. WOAH! I am in love with this look. You can sport a braid or even leave your hair open with this attire. Make sure the colors are of the same family and you do not go overboard. You don’t always need a kurta to wear plazzo’s. All actresses are wearing this kind of outfit. This look was sported most by Priyanka Chopra in Dil Dhadakne Do. She wore different kinds of plazzos, one particular look was with a white plazzo along with a stripe crop top, hat, heels, minimum jewellery. This look was modern and beautiful. Take inspiration from her and match you plazzo with crop tops and jewellery. Aazaro is like a newer version of plazzo. It has more ghera (pleats) on the top to give more space at the bottom. So basically it looks like a long skirt. You can match it with crop tops, peplums or kurtas. We have seen the kurta trend change over the years. No one is fond of the old school, plain boring kurtas. Printed, painted, embroidered, etc are the trends everyone is fond of. 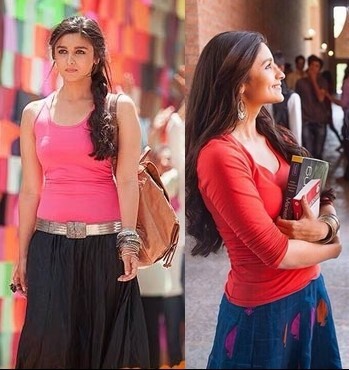 Alia Bhatt wore these beautiful kurtas with plain pujami’s in 2 states and she looked beautiful. Dupattas are so old school. Chuck the dupattas away, wear a scarf with your attire. Carry a traditional, ethnic looking college tote bag and you’re done. You can ever wear your normal jeans or jeggings with your kurti.